Just got home from the Notorious Hammer event in Johnsonville, Wellington and I’m here to let everyone know how it went. 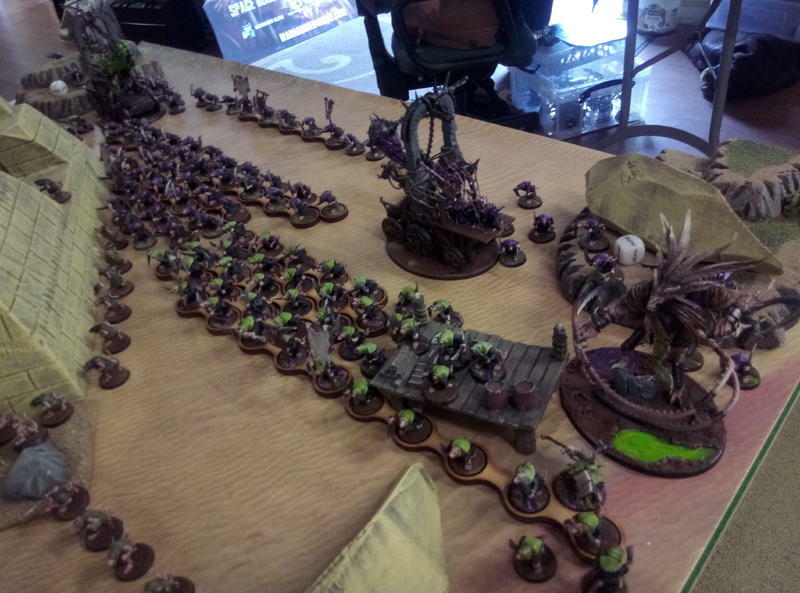 The tournament went overall exceptionally well, big props to Shaun from Notorious AOS (https://notoriousaos.podbean.com/) for T.O’ing the event and running a tight ship. Once again, the New Zealand Warhammer scene is better for your efforts. Everyone had a great time and there was a great field present for 2 days of great games. Wow. Set up my army with a Clanrat screen 40 long and 4 lines deep to brunt the massive Witch Aelf assault and Shaun just wasn’t having it. Smoothly punching through my lines and delivering a powerful follow up punch making use of the army’s ability to pile in effectively, and supporting his front line with the Cauldron of Blood and Morathi herself, Shaun schooled me hard on playing an all melee army. This tips the balance towards Shaun in our ongoing tug of war for supremacy, and I’ll absolutely be gunning for him next tournament. Shaun (Big Shaun for Notorious listeners) opened with the same strategy he used to wipe the floor with me at Call to Arms 2 months ago. Deploying his Sequitors and Evocators along the line ready to charge in after absolutely smacking the hell out of me with an Everblaze Comet, Shaun lined my head up on the block from the start of the game. Unfortunately, his comet failed to cast and his alpha-strike play was unable to clear me off the objectives due to burning a command point to pass battleshock (cheers battalion people said not to take). This prevent Shaun burning my objectives on turn 1, and I retaliated with a lethal counter-surge with Plague Monks that saw Shaun pushed backward and eventually cleared away. The Realmscape rules here saw units unable to fly banned from run moves, forcing myself and Regan to aggressively footslog towards the objectives shooting each other nasty glares. Regan arrived first, scoring an early lead and building a wall out of Anvils of the Heldenhammer, but my counter-offensive benefitted from some choice dice rolls and superior mobility with the Clanrats retreating and charging around their slower, more powerful opponents. With the points under lock, I turned my focus to exterminating the lethal Anvils before they could use their formidable command ability in conjunction with their Evocators to send me packing. Cameron and his 3 Engines of the Gods opened the game by summoning 60 Skinks to the table to shore up his middle position while I spread my army out without committing to any one side. This proved to be a wise move, with the centre and enemy objectives being in the left board side and my own on the far right (appropriate). My Clanrats on the right retreated immediately to secure the home point while the rest of my army slammed into his endless ranks of Skinks and set about punching through them. With a gap formed, the Verminlord darted through and artfully brought the Astrolith Bearer and an Engine to the ground, while blocking the summoning range of the other engines and the Slann. With all objectives tightly in my grip and staring down the barrel of a slow and steady death at the hands of pestilence, my opponent conceded to save time. Match of the century at the top table, with the winner set to win the whole tournament, nothing about this match was carefree. Me and Lee are actually neighbours and play each other more regularly than any other opponents, so this was set to be a great game. Lee artfully matched my playstyle of massive aggression followed by retreats and more aggression with his defensive, never committing to any one area till late-game style. The points were neck to neck with the leader changing each battle round, each of us making counter-moves we’ve practised against one another a dozen times to throw the other back and upset their plans. Highlights were Lee committing allied Idoneth eels on a suicide mission to kill a lone Plague Priest who was actually a core component of my left flank strategy (Lee never throws units away, so he knew he could set this up without me expecting it) and the would-be assassination of the outlaw Verminlord Corruptor by the Treelord Ancient into that scene from Avengers where Captain America tears a log in half. Lee won with a clever last-minute commitment to my crippled left flank and took the game, a well-earned victory. Everyone had a great time and there were no dramas or last-minute point corrections. I ended up 4th, almost clinching the title of first Pestilens player in the world to podium at a registered event, and learned a lot on how to improve my play. Looking forward to the next events of the year, and to the upcoming Notorious AOS GT coming next year. If it’s as good as this event, it’ll be one I can’t afford to miss. Great write up, Aiden. Can't wait to have a rat-off with you some day. I think Reagan won best sports, Seth C was a runner up. Thanks for the great write up and the beautiful pictures. Congrats on your results ! in my ratlike heart, you are the true Winner of the tournament. Just wondering how many plague monks you used. 90, arranged in 3 groups of 30 which were supported by two allied blocks of 40 clanrats. With Tzeentch meta finally over I feel safer taking the large numbers again. Let me introduce you to my Wurrgog someday. ? Big fan of your blog Aiden all the way from Ireland. When is your next big event? I have all the faith in you to crush the normies. Will be keeping an eye out on the blog during the run-up to it. Hi Aiden, wanted to let you know how I did. Overall, I got one win and two losses. First game against Seraphon, lost by two points. I deployed terribly (more on that later), and almost clawed it back at the end, but it wasn't to be. He was a very good player and had these things that could deep strike within 3" that wrecked my backline. I hadn't played against Seraphon before, so possibly should have done more homework. My opponent went on to win the tournament. Beat Ironjaws in the second round, and it was a hammering. He charged everything into my clan rats first turn and killed them all. Then my Plague Monks proceeded to charge into his units and practically wipe his entire army. He conceded. Third game was against Order Draconis. Not a bad matchup, but the mission wasn't ideal. 3 objectives each in our territories and we had to hold them for as long as possible. He penned me in first turn (everything could just move over 20"!) and I had no opportunity to get up the board to threaten his objectives (I found this to be a general issue with my list). I killed far more points of his stuff, but struggled to play the mission. I'm not too downbeat, as they were only my 4th, 5th and 6th games of Age of Sigmar. Learned a lot and hoping to win at least 2/3 in the next one in January. One of my most enduring enemies of the day was a giant pyramid terrain piece on the table where both my losses took place. My seasoned opponents knew what a pain this would be for me and plonked me in the territory with it, often walling off up to a quarter of my hordes. I completely made a mess of this first game, deploying my clanrats in a way that they couldn't get out of the thing. My opponents, with all of their flying units, took full advantage and it ended up being a deciding factor both games. First of all, love the color scheme my friend and would love to see more if it. Seraphon are indeed tricky, the way to beat them is to shamelessly string allied clanrats around your army to catch what they thrw, then slam a counter punch with plague monks similar to what you did with the Ironjawz player. If they instead wall up and sit back to get ready to summon, that's your cue to push up hard (burn command points for 6 inch runs if you have them) and spread your army out so he has nowhere he can summon or teleport his units. Spam your prayers as much as possible and kill the slann with them from behind enemy lines. I would recommend the same strategy against Order Draconis, but the trick there is targetting down the big dragons one after another. Most importantly, never be afraid to retreat. You don't lose the game if you lose more troops than the enemy, and sometimes retreating onto an objective to contest it before being wiped out is a more valuable spend of skaven than sending them to die in combat. Thanks for the advice! I'm investing in 40 more clanrats anyway, might throw them in at the expense of a Furnace. Was also thinking of giving my Verminlord or a Plague Priest the Liber Bubonicus instead of trying to equip my Verminlord for combat. I have found my best games so far have been keeping him behind and using him as a buff. A Verminlord sprinting out and fighting something is the hallmark of a game that has taken a turn for the worst. Killed all his dragons apart from one, which had an artefact that meant I couldn't attack him until he attacked me. That was all sorts of grief that I wasn't ready for. Also, there was a special rule for the entire game where rend didn't count, so his stuff dropped far slower than normal. I also didn't realise you held objectives even if they are abandoned. So I didn't know that he was clocking up points for the objectives he vacated. I really have to get rid of the residual 40k in my head, some of my calculations and moves are still heavily affected by it! Will definitely start retreating more, I don't think I did it once in any of my games.